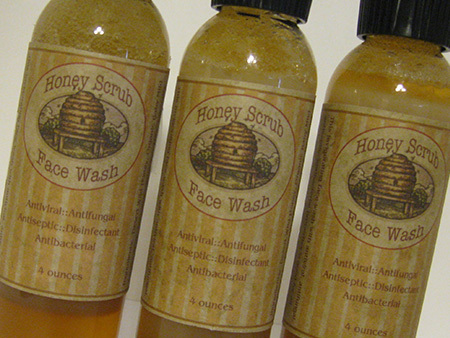 Try our Honey Wash for beautiful skin, wound healing, acne, psoriases, eczema, boils. Use on your animals for cleansing of wounds and skin issues. 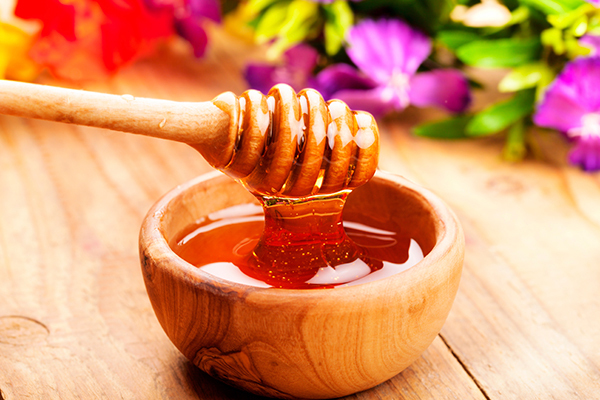 Did you know that honey is the world’s most perfect food for the skin, hair and body. It has also been proven that bacteria cannot live in the presence of honey due to the fact that honey is a great source of potassium which withdraws bacteria & moisture that is essential to its existence. Honey has been used in previous wars when antibiotics were not available. I could go on and on about how much I love this wash – but on my website I pretty much go over how valuable this soap is for beautiful skin, psoriasis, eczema, pimples, boils, bites, wound healing. You can apply as a liquid band-aid and let it dry. A four ounce bottle will last for 2 to 4 months. I’ve used this on my skin for 16 years and my skin shows it. It’s very dry in Arizona and is a lifesaver. It’s also valuable beyond belief for animals with skin problems and wound healing. I recently sent a customer who ordered my dog products – a Honey Scrub Wash, but changed the label to “Canine Wound Cleanser”. Click here to read a previous post about the facial moisturizer you can make in 2 minutes – there is honey added and it’s so nice – especially for hydrating in the summer time. I am a 20 year old, sophomore Cochise College Nursing Student. For the past five years I have been fighting acne. My mom has taken me to two different dermatologists, have tried antibiotics, and for the past year have been on Proactive. For the most part, the best these things have accomplished is perhaps kept my acne in check. None of these have ever rid my face of it. Last year when I joined the nursing program, the stress mixed with whatever was in the air in the hospitals made my face totally break out in acne, more than ever before, even with the treatments! I gave up at this point, until one Saturday at the Bisbee Farmers Market where you introduced me to the Honey Scrub Face Wash. In one week, my blistered face was clearing, and in two my face was so smooth and fresh, something I haven’t felt in over five years! The true testament to this product came when I returned back to school, I’ve been in the hospital, dealt with numerous stressors, but my face is still acne free!! But to top things off, this product has helped my mom and myself with our sinuses and allergies (I have chronic allergies to the point where I get shots). I haven’t gotten a sinus headache since I started this product! Thanks for introducing me to this product! !